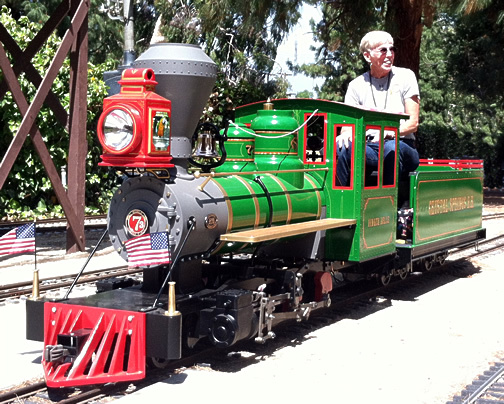 Sweet Creek Mogul Live Steam Locomotive by RMI Railworks - Miniature train and railroad equipment for your club, backyard, mall or park. When narrow gauge railroads began to thrive and expand, their operating departments felt the need for larger, more capable locomotives to handle heavier loads over longer distances. To fill this need, Baldwin built many Mogul class locomotives for passenger, freight, plantation, and mining service. These engines were sold around the world, and some are still in service. Sweet Creek is an excellent example of this type of locomotive. The ride is exceptional and extremely realistic. A heavy-duty, 2-6-0 Mogul, it is built in 3 3/4" scale and runs on 7 1/2" or 7 1/4" gauge track. Sweet Creek is a large locomotive; the operator sits in, not on, the tender, allowing easy access to all controls, even for the largest scale engineers. It is the ultimate club/estate engine, capable of hauling very heavy loads up steep grades for prolonged periods. Building Sweet Creek will provide hours of pleasure. The simple, robust design means parts are easy to produce and handle. For those with limited machining facilities or limited time, machined parts or complete locomotives are available. The Sweet Creek is also available for indoor operation by using our electric powered tender. Perfect for shopping malls and indoor events. For the ultimate live steam experience, you must run a Sweet Creek!